Weighty Matters: Does Diet Pop make you Fat? Maybe if you're a rat, but even then, only maybe. The media is going crazy today for a study that looked at rats consuming saccharin (yes, saccharin - a sweetener currently banned in Canada) sweetened yogurt. The study found those same rats later consumed more calories and the researchers postulated that it was a compensatory behaviour. 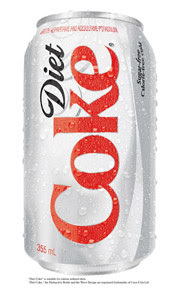 The media of course has postulated that therefore in humans (a long leap from rats), consumption of diet pop sweetened with aspartame and Splenda (long leaps from saccharin), leads to weight gain. They also point at the recent study that suggested diet pop drinkers have greater risk for metabolic syndrome, but of course in that study they don't note that drinking diet pop is almost certainly a marker for other eating behaviours which may be more likely to account for the slight increase in risk. "that replacing (added) sugar by low-energy sweeteners or by complex carbohydrates in an ad libitum diet might result in lower energy intake and reduced body weight. In the long term, this might be beneficial for weight maintenance." "The aspartame group lost significantly more weight overall (P = 0.028) and regained significantly less weight during maintenance and follow-up (P = 0.046) than did the no-aspartame group." My take on the rat study? If the researchers fed the rats low to zero calorie meals by means of artificial sweeteners, it would not be surprising for those animals' bodies to note the lack of calories and compensate later in the day in a normal response to a low-calorie meal. Put simply, they compensated because they got hungry. Of course, that's not how people tend to use sweeteners, and certainly not how I would recommend that they be used. People tend to use sweeteners to eliminate excess calories, generally liquid calories, but of course still consume sufficient calories from their meals to register that they've eaten. Therefore their bodies don't generate excess hunger, don't compensate later in the day and do avoid the excess liquid calories that they have replaced. Long story short, I wouldn't throw out your diet pop just yet but don't have just it for breakfast.